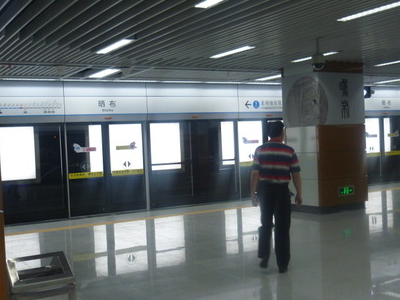 Shaibu Station (Chinese: 晒布站; pinyin: Shàibù Zhàn), is a station of Shenzhen Metro Longgang Line. It started operations on 28 June 2011. It is located at the intersection of Shaibu and Middle Dongmen roads. This station is near Dongmen, someone who want to visit Dongmen can get off at this station or Laojie Station. Shenzhen Middle School is also located nearby this station. Here's the our members favorite photos of "Metro Stations near Luohu". Upload your photo of Shaibu Station!